A magnifying glass is naturally great for those who work with small print and details, such as designers, estheticians, and examiners. Combine a high-quality lens with a high-quality lamp and we’re talking A+ visibility. Is your workspace and lifestyle in need of a magnifying desk lamp? Well, let’s find out together as we go over all the great benefits magnifying lamps have to offer. Magnifying lamps combine quality lighting with high-focus magnification for ultimate visibility. They more clearly reveal the intricate features of small objects, especially if your work environment is poorly lit with glares and shadows getting in the way. The combination of both an LED lamp head and magnifying glass allows for crystal clear, shadow-free visualization. No more squinting for you! If you work with small details, such as blueprints, jewelry or historical artifacts, you may very well need a magnifying lamp. Though, you don't have to be a pro to experience the luxury of a magnifying light. You may also incorporate one into your home to complete your favorite hobby, such as reading, sewing, crafting, or studying. What are some of their features? 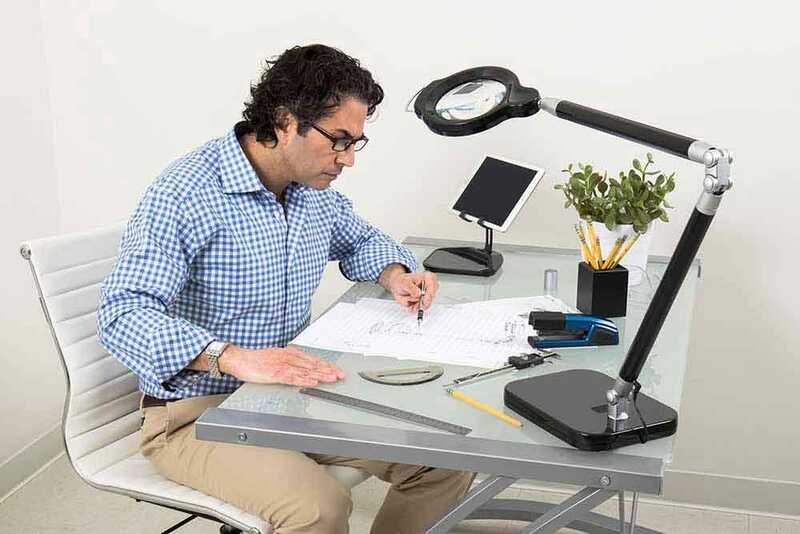 Among the brilliant clarity, magnifying lens desk lamps allow for hands-free viewing. That means both of your hands are free for completing any needlework, embroidery, or model making; there's no hassle of having to grip a handheld magnifying glass. Exclusive to our PureOptics™ 5-diopter magnifying desk lamps are the added features of an integrated USB port for quick and easy device charging, and 34-inch adjustable lamp arm and heads. The five brightness levels and daylight color temperature provides customizable, natural looking light which aims to reduce eye strain. Addititonally, there are multiple ways to mount it! Use the standard base, or use the adjustable clamp mount or permanant through mount. Most of the time you will see the term diopter when shopping magnifying lamps. Basically, diopter magnification refers to the lens power, or the lens’ curvature measurement. The larger the curvature, the thicker the lens is which then leads to a greater magnification. Our PureOptics™ magnifying desk lamps have a 5-diopter lenses, meaning any object under the lamp lens is magnified to appear 225% larger. As always, our desk lamps use cost-efficient PureOptics™ LEDs last up to 15 years and use 85% less energy than incandescent lamps. Place them on your desk for stunning and reliable illumination no matter the time of day. Still not sold? Well, maybe all you need is to browse our extensive selection of LED lamps to choose the right one for you!